A BIT OF CHURCH HISTORY. Athena Press, 2010. Price £8.99. As a former Cub Scout whose ‘pack’ met at St. Luke’s, I found this short book (91 pages) an evocative account of development and recent history of St. Luke’s and its site. The author, David Bunney, was the last Minister of St. Luke’s, and his description of the events leading to the church’s closure and the last service held there is both sad and touching. 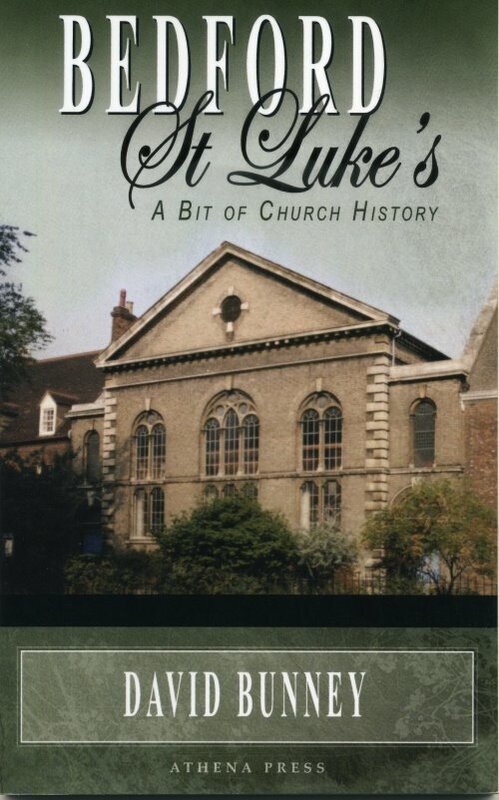 For anyone with past connections with St. Luke’s or an interest in the development of the church and its buildings and its organ (to which an entire chapter is devoted), or more generally the history of Christian worship in Bedford, there is much of interest to be found in this book. Bedford St. Luke’s was originally a Moravian foundation in 1745, known then as the Bedford Congregation. The name of St. Peter’s Moravian Church was adopted in 1895 to distinguish it from the newly founded Queen’s Park Moravian Church. Members of Bedford’s embryonic Presbyterian Church asked to share the premises from 1952. This grew into a formal relationship, resulting in the formation of St. Luke’s Church in 1960. With the closure of the Howard Congregational Church in 1969, its members joined St. Luke’s in 1970. The church became a constituent member of the new United Reform Church in 1972. St. Luke’s closed in 2008, with the final day of worship on Sunday, 5th October, 2008, ending 263 years of Christian service on the site. A Moravian Society was formed in Bedford after the smallpox outbreak of 1738-39. By 1742 there were 42 members, but followers were not recognised as a congregation until 1745. They acquired land in St. Peter’s Street where Brother Boehler consecrated the chapel and the burial ground in 1751. The church, the Bedford Congregation, was at the centre, with the Single Sisters’ House (24 St. Peter’s Street) to the west where the women earned a living through needlework and embroidery. The Brothers’ House was to the east (this later became the Minister’s Manse) where they earned their living by baking bread. The bakery was converted into a Sunday school in 1801. The Moravian Ladies’ School was a prominent feature in the life of the Church from 1801 until 1914. The original chapel of 1751 was replaced by an enlarged one in 1795. This proved to be inadequate by the 1850’s, and was replaced by the current building, at a cost of £2,000. Designed by James Horsford. It was officially opened on the 9th March, 1865. Sadly, during the laying of the foundation stone in June 1864 part of the roof of the old chapel fell among the crowd, injuring Sister Martha Trapp. Later the chapel was enlarged to the north to accommodate a new organ. This book is certainly worth reading by anyone with an interest in the history of St. Luke’s or the Moravian heritage. It would, however, have benefited from more illustrations, particularly of the interior of the chapel. I also found the structure of the chapters distracting – alternating between general accounts of the development of Moravianism and Presbyterianism and their local expression. I found the former of limited interest, but to be fair, it does provide essential context.